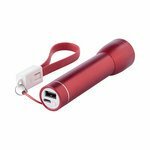 Promotional power banks are a must have for people on the go. Branded with your logo these power banks are ideal for charging mobile phones and tablets including iPhones, iPads, Samsung and Nokia. They have great imprint areas for the printing of your logo and are one of those mobile phone gadgets that is going to become relied upon, always promoting your brand. If you would like to see how your logo would look on any of these power banks please send this to us and our design team can then generate a virtual visual for you. We can also supply samples from previous marketing campaigns. We are forever reliant and run by modern technology. On the train, in the car and constantly on our travels, a mobile phone or tablet without battery, is pretty useless. 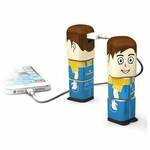 So what is the main positive to giving out power banks as a promotional gift you ask? Let’s start with the most obvious point; nobody likes that moment when their phone battery is just about to run out and they’re nowhere near a plug socket. So simply plug in your mobile device to a charged Power Bank and you are good to go. It’s easy to recharge powerbanks as well. Just plug into a USB 2.0 port or a wall socket using a USB plug and your powerbank will quickly recharge. It doesn’t matter where you are. You could be on the beach, at a sports game, or waiting for your train with a Power bank you will never be without a charge. Waiting for that all important email or needing to make an urgent call and you’re faced with a blank screen is simply frustrating. 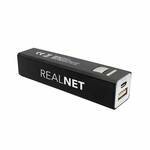 Simply connect your device with a USB cable and you’ll be ready to go. 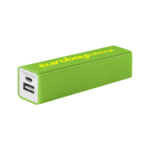 Powerbanks are also extremely lightweight and easy to carry. You can carry a powerbank in your pocket, handbag, briefcase or backpack. 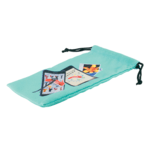 This makes them perfect for travelers and busy professionals alike. They use the same type of lithium-ion battery used within smart phones and tablet computers and will give several hours of boost charge to a poorly charged device. 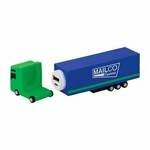 Whilst power banks are compact in size they do offer a reasonably good sized print are for your logo and imprint. The size will be very much dependent on the product and most imprints will be applied using a screen printing mechanism or where available a digital print. Please check the specifications page for each product if you need more information on the available imprint areas. Our design studio can help with any artwork issues. 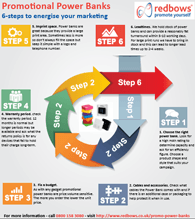 Please feel free to add our Infographic to Pinterest or share this Infographics PDF. 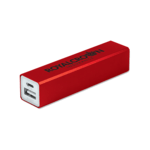 Power Banks are designed to fit into a pocket or case and are portable. 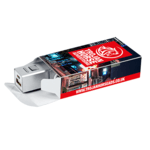 With each product we supply a product specific charging cable that can be used to charge the Power Bank from a compatible USB port or USB plug. 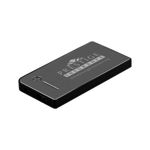 The produce will also provide a port to which you can connect the relevant charging cable for your smart phone or tablet. Please always check with us if you are in doubt as to compatibility between the product and your device. If you don’t have printer ready-artwork please let us know. Our in-house design studio can generate this for you from your logo file. Printer ready artwork is one that is vectorised and of the type needed to screen or digitally print your logo onto a product. We quote all lead times from artwork sign off. Orders can be placed on-line via our website checkout and the process also allows you to upload an artwork file. 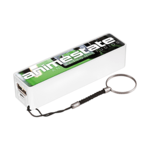 We use a screen print typically for power banks and print in the available print area. This means that we will use a number of screens relating to each of the colours in your logo. So if you use 2 colours, that is 2 screens. Most clients choose their logo, website and sometimes a telephone number. 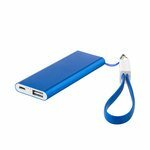 Each Power Bank is supplied with a cable to connect to a USB port or USB plug and can be used to charge your chosen Power Bank. 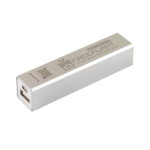 You then need to use your normal phone or tablet cable to connect to the USB port on the Power Bank in order to use the stored energy in the battery. How long will a power bank last? Power banks store electrical energy in their lithium-ion batteries. This is the same type of battery in your smart phone or tablet computer. The batteries charge very quickly and typically within an hour. When used to charge your phone or tablet the batteries will take as long as it takes to transfer their energy to the device and typically within an hour or faster. Power banks can be left for several days if not weeks with their charge as there is virtually no self-discharge.